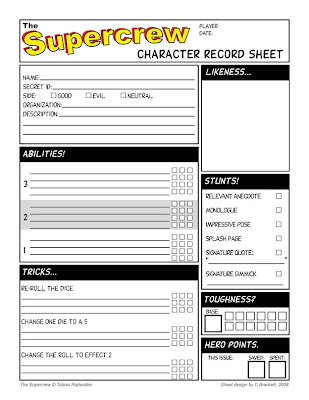 Following on with the theme of the last character sheet I posted, here's another sheet for a supers game. Okay, so The Supercrew by Tobias Radesäter is by no means a classic game (and most of you probably have never even heard of it). It's been around for less than two years (as of this post) and its fairly slick production value belies the game's youth. But it's arguably an old-school RPG at heart. Presented in a comic-book-like format, The Supercrew is an uber-rules-lite game. It puts the focus squarely on the action of the story, leaving players plenty of latitude to contribute to the story. 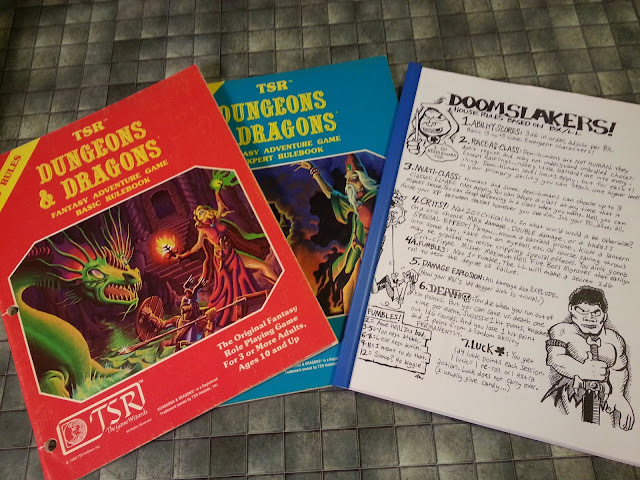 While it's definitely not a game for gamers who need rules to guide them in every situation, or for GM-versus-player groups, it's a fun little game that leaves a lot of room for players who like to have fun adding to the "story" of the game, and for those of us who like to tinker with house rules. I like it! If you're interested in the house rules behind this specialized sheet, you can find them here. BFD (Big F!%$ing Disclaimer): These house rules are mostly untested and in no way well explained. You are on your own!